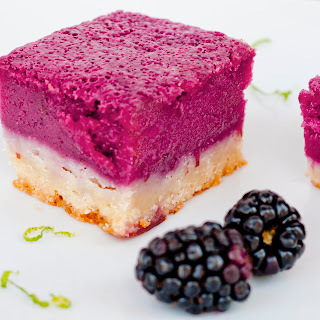 Yesterday I posted these amazing raspberry lemonade bars and today I wanted to show you an improv version of the recipe. 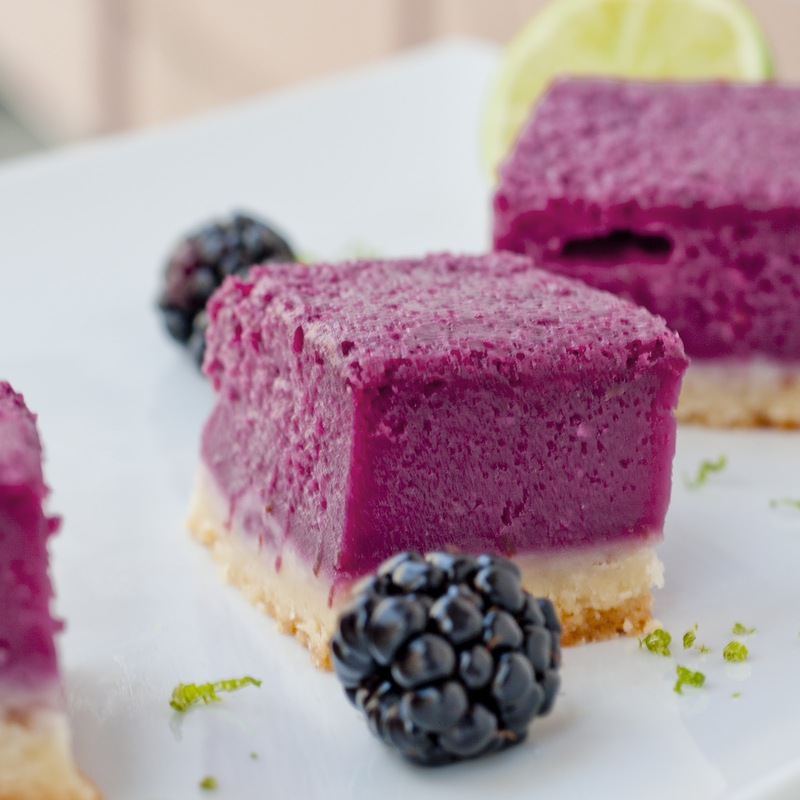 When I first saw the original recipe I couldn't decide which to make... the original or the first thing that popped into my head, blackberry lime. Raspberry lemon is such a classic combination. One that I fall for every time. I'm not sure which ones I like better. Honestly they taste like two completely different desserts. You only substitute 2 ingredients but it's crazy what those little tweaks can do. Hopefully this post will show you what adapting a recipe to your tastes could be like. And seriously, someone please do the raspberry ones and blueberry ones for 4th of July. It's perfect summertime dessert fun with a patriotic twist! Preheat oven to 350º F. Line an 8x8 baking pan with parchment paper so you can easily lift the bars out once they've cooled. If you don't have an 8x8 that's ok. I did this in a smaller rectangular pan too and they turned out just fine. You may have to adjust the baking times depending on the size. Cream the butter and sugar together with an electric mixer, then add the vanilla. Add flour until just incorporated. Dump dough in baking pan and press with your hands until it evenly covers the bottom of the dish. Bake for 20 - 25 minutes until slightly golden brown. If you, like me didn't have enough time for the blackberries to thaw on their own, place in microwave for 1 minute to soften them up. Then put in a fine mesh sieve and press the berries through (this removes the seeds) into a large bowl. If you don't mind seeds, you can add them in whole. Or if you don't have a sieve, you can blend them up in a food processor or blender. Add sugar, egg whites, egg, lime juice + zest, flour, and salt to the bowl and stir to combine. Pour the mixture into the crust (don't worry, it's a very loose mixture, it will thicken) and bake for 25 - 30 minutes depending on your oven and the sized baking dish you use. Let cool to room temperature and then place in the refrigerator for 4 hours (or until they've cooled completely). You can place them in the freezer if you need them sooner but refrigerator is best. If you can wait overnight, that's even better! i prefer my bars with a good amount of tartness. if you have a sweet tooth, consider increasing up to 1½ c. sugar. it looks delicious! i'm going to try them out, thanks for sharing! I'm picking a pint of Blackberries a day! These look amazing. Can't wait to try this! Thanks! So much fun! This weekend I'm taking a dessert for a group, and need to find somthing low-sodium for a particularly salt-sensitive friend, and these are perfect. Just found these on Pintrest, they look like they taste great. Thanks for sharing! Yum, looks delicious and the color is great! Thanks for sharing , have a nice day! thanks will! i'm so glad you like the post and blog! i hope you love the bars!!!! Can't wait to try these! Serving for my fiesta girls night with blackberry mojitos! YUM! sounds perfect! hope your ladies night is a hit! the color will depend on the berries. the reason the outside dried out and the middle didn't set is probably because the dish you used was too deep. you could try using a little less of the filling and reduce the cooking time. or, perhaps your oven runs a little hot. you could try reducing the oven temperature 25 - 50 degrees. the filling should jiggle slightly. when you let it sit in the refrigerator to cool,they will firm up a bit. i hope your second batch turns out better! i would think you could freeze them. i've never tried it myself. if anything, it might change the consistency of the filling. if you do freeze them, let us know how it turns out. i can never keep them around long enough to freeze! you do not have to beat the egg whites first. just put them in whole! hope you like the recipe! thanks for visiting the blog! italy is dear to my heart! ciao! These look wonderfully delightful. I've got a potluck to go to and these are just the ticket! Thanks for the great recipe and the adaptations too! I made the raspberry lime version with an extra 1/4 cup of sugar, a dash or two of cinnamon, and a graham cracker crust (2 cups graham cracker crumbs, 1/2 cup butter (melted), and 2 Tbsp sugar). It's like the most perfect tiny pie! I love it! Thanks for sharing your improv's! This is exactly what I hope people will do with every recipe I post. This is a little tricky. You can't use less egg because the filling wouldnt set. I would suggest using gelatin and playing around with how much you use. In this instance you would want to cook your crust to a light golden brown and then cook the filling mixture in a sauce pot (minus the eggs, with the gelatin). You might have to experiment with how much gelatin you use. Then you'll pour it in your crust & let it set in the refrigerator until it sets. You'll want it semi soft but not so soft that it doesn't hold when you cut it. If you try this, please let us know how much to use! Great question! I made this recipe to take for a Father's Day dinner and it was a complete disaster. The ingredient list calls for vanilla extract, but the recipe never says when to mix it with the other crust ingredients. My crust ended up floating into the filling, so it didn't set right, looked awful and the texture was all wrong. I'm not an inexperienced cook, so I was hugely disappointed when this recipe didn't turn out as expected. It looked so delicious in the blog post. i'm so sorry, you're totally right! i completely forgot to say when to mix in the vanilla. i'll edit the recipe ASAP. thanks for pointing that out, doh! you mix it in with the butter and sugar. i'm so sorry it didn't turn out for you. did you bake your crust first? i'm not sure why it would float into the filling if you baked it first. i've had tons of people make this recipe and that's never happened. the only thing i could say is give it one more try. sometimes when i make recipes they flop due to human error that i didn't even realize i did. i'm sorry you had such a bad experience with the recipe. hopefully if you try it again, it will turn out! the texture isn't exactly like a lemon bar - the filling is a little thicker and less gooey, if that makes sense. you could play around with the filling if you're looking for a more traditional gooey lemon bar (try adding in some blackberry puree to your favorite lemon bar recipe - just account for the extra liquid by removing some or increasing the eggs). thanks for sharing sam! i'm really glad you liked them :) it's always so nice to hear positive feedback. from your pictures it looks like the crust might have floated up into the filling... did you have that problem? one of my other readers complained of this. if it did, did you by chance bake your crust first? if not, i'm glad it turned out and that you loved the recipe! I think the white spots in the pictures are pockets of lime juice and flour that had trouble mixing in. I did bake my crust first for 25 minutes and let it cool before putting the filling in. I'm in a dorm so I didn't have an electric mixer and instead was using a fork as a sort of whisk. If I make them again (which most likely I will) I will have to blend the filling better. fantástica vista y seguro que mejor sabor. New here via Pinterest. :) Thanks for the recipe! So I "improvved" on accident. I got Black Raspberries! That's what I get for not paying close attention. I am happy with the results though. Definitely unique and had a slight cranberry taste- vaguely reminiscent of the cranberry sauce at Thanksgiving or Christmas meals. I added 1/2c more sugar as we like things a little sweeter here. I had to laugh- either your limes were sad or mine were on steroids! I only had to use 2! They were so juicy. I also had to bake my bars 20 minutes longer. Not sure if it was the difference in berries or my oven- or both. I also recommend letting the bars sit at room temperature for about 10 minutes after removing them from the refrigerator. This allowed for easier serving and a better taste. Too cold and they lost their zing. they look gorgeous! thanks for sharing your story and thanks for stopping by! every oven is different. i had to bake them 20 minutes more this past weekend at my future in-laws house. the type of pan you use will also affect cooking time. I am very excited to try these! But are the measurements in T. teaspoons or tablespoons?? Just made these, they're in the fridge cooling right now. Hope they end up looking half as good :) One thing I wasn't sure about was what the constancy should be when it's ready to be removed from the oven. I'm not an experienced baker! But it seemed pretty jiggly even after being in more than the time you said. Thanks! the consistency should be a little giggly, but not crazy wobbly. think about what jello looks like when jiggles. i hope this helps! every oven is different and depending on how deep your dish is, cooking time can vary drastically. i hope they turned out great! When I made these the filling was outragegous in quantity compaired to the crust. I might use half of the filling next time. it all depends on the size of your dish and your own personal preferences. i think halving the it is a great idea if you felt that the filling overwhelmed the crust amount. sorry it didn't turn out exactly how you hoped the first time. hopefully if you make them again, you'll get it just the way you like it! thanks for sharing! Very excited to try this recipe! 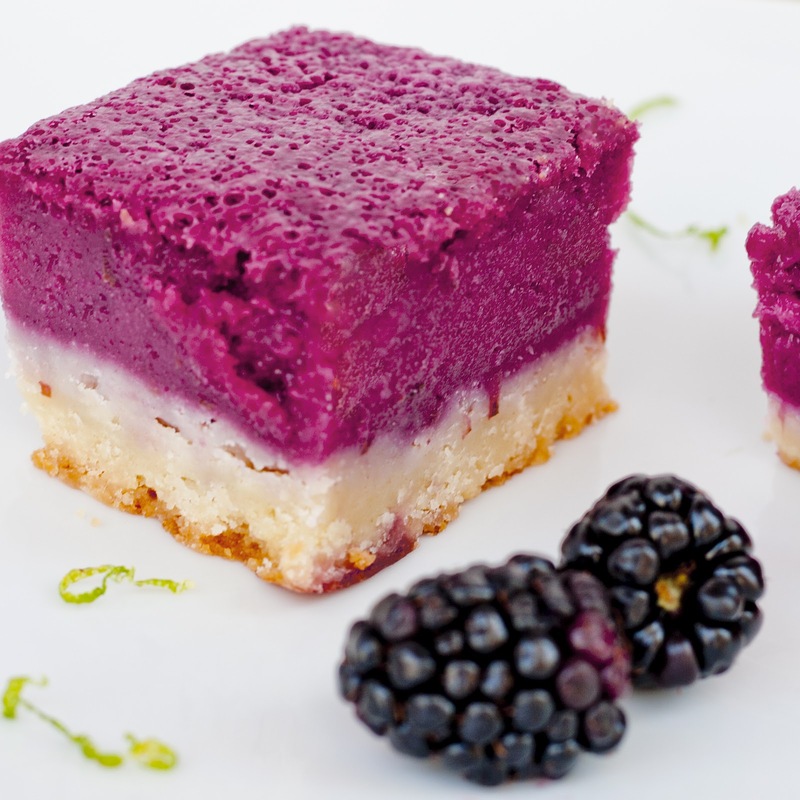 Do you think it is ok to use fresh blackberries instead of frozen? you can definitely use fresh! that's why i listed out the juice amount in cups as well as frozen bag size. just make sure your fresh blackberries yield 1c. of pulp/juice if you're making a full batch. Ack!!! I can't decide which ones to make first!! This recipe looks wonderful! I can't wait to try the blackberry/lime version! I saw your suggestion list though & had to start with a grapefruit bar. I used 2 large grapefruit, 1 lemon & 1 orange for the juices. I'll be taking them tailgating at a Jimmy Buffett concert tomorrow & thought it would be perfect! Grapefruit juicy fruit! They certainly smell good, so I hope they taste the same. Thanks so much for the idea! Update-- Grapefruit did not work well. They smell like citrus, but there is very little flavor. Just a slight tang. Any suggestions on how this could be improved? oh no! if you're wanting it to taste like grapefruit i would suggest using all grapefruit juice instead of combining the juices. you'll actually get more citrus flavor from zest than you do juice. i would try doubling the amount of zest you added and go from there. you don't want it to be too bitter but i think increasing the zest will help a lot. just make sure to avoid the white pith when zesting. that will keep it from getting too bitter! 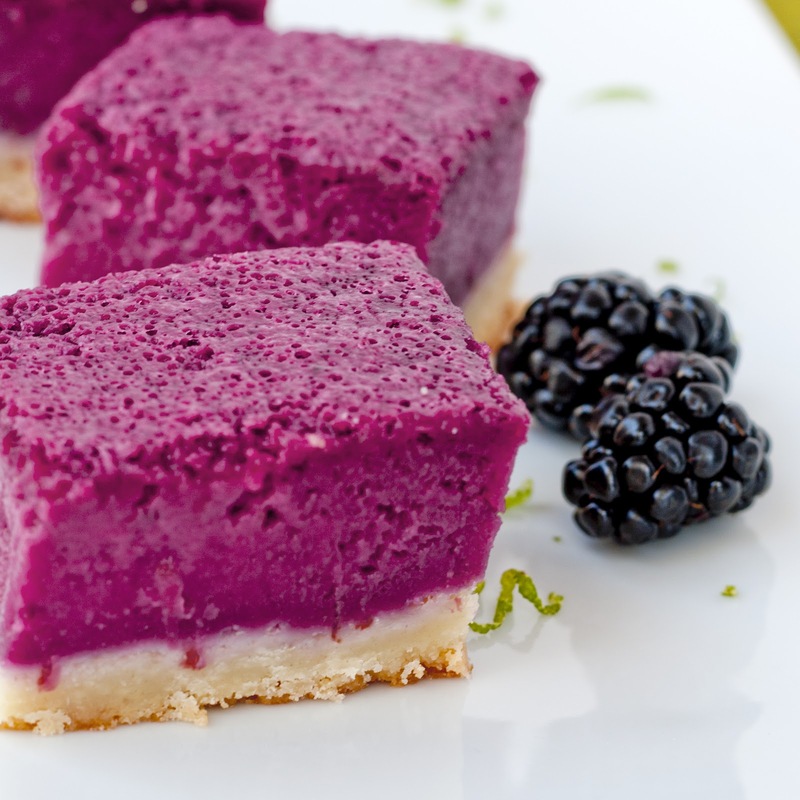 I just made this recipe for my office and the taste was terrific! My only complaint was the texture. It was a little more gooey than I had anticipated rather than the fluffy texture in the picture. Any suggestions on how to make it a little more airy? mine were actually pretty gooey too - that's how i like my lemon bars. i think they might have appeared airy because of all the bubbles in the picture. i'm not sure why there were so many bubbles in this batch - probably the egg beating/baking process! but they weren't light and fluffy, i promise. 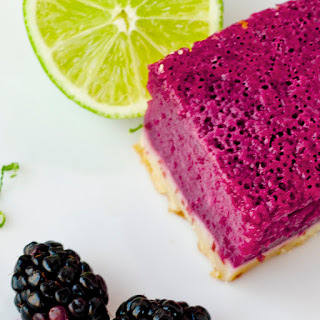 maybe try doing a blackberry lime juice mixture with gelatin instead of eggs. then fold it with whipped cream or cool whip to get a more airy texture? Hey there! Made these but substituted the 9 tbsp butter with 1/2 cup applesauce and 5 tbsp butter to cut some calories and the crust was great! Wondering if I can post on my blog with the substitution giving you credit of course! Hi Candace! Of course you can share the recipe with your substitutions on your blog! Just make sure you share a link to the source and use your own image! I'll have to try to make them with your substitutions! Thanks for adding your improv tips! hi, I was just trying to print this, but I don't see a print button on this page. When I use my browser's print button it says it will be 20 pages long. any ideas? I figured out that by using two loaf pans because I didn't have any others, they turned out perfect instead of too gooey. They were very gooey when I pulled them out of the oven but the solidified after being in the fridge over night. When I poured the berry mix over the crust I could have sworn it would soak into it and make it mushy and never harden. But it all worked out=) Also, when I was mixing it with my whisk (I have no mixers) The flour looked like the white spots that other person had. It did look like dough coming through. But I kept mixing forever and it was awesome. I thought it would either be super sweet or sour and bitter. It was very tart but not too tart. Perfectly sweet with one and a half cups of sugar.